Now that you know what a display is, the next concept you need to understand is “slides”. Slides in MPF are just like slides in a PowerPoint presentation or slides in an old-fashioned slide projector. Every slide in MPF has a priority, which is simply a numeric value. Bigger numbers equal higher priority. Since only one slide is shown at a time, whenever there is more than one active slide, whichever slide has the highest priority will be the one that’s shown. 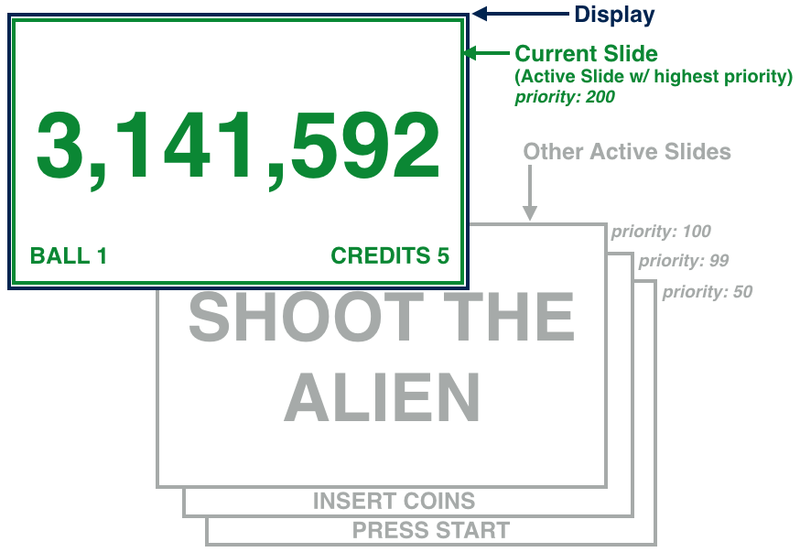 For example, you might have a general score slide at priority 100 which shows the current player’s score, the ball, the credits, and maybe the scores of the other players. If the player shakes the machine too hard and a tilt warning slide is shown, then that tilt warning slide might be activated at a priority of 10,000, meaning that it would be shown instead of the general score slide. Then after a few seconds, the tilt warning slide might be removed, and MPF will then show the next-highest active slide which would most likely be the general scoring slide that was showing before. The slide priority system is integrated into MPF’s mode system, meaning that slides created by modes automatically inherit the priority of the mode that’s showing them. Put another way, a slide from a higher priority mode would show in place of a slide from a lower priority mode (though every mode doesn’t need to have slides). You can also tweak the priorities of slides (higher or lower) to make sure the slide you want to show is the one that’s showing at any given time. We’ll dig into that later in the documentation. When MPF is used with multiple displays, each display maintains its own stack of active slides. 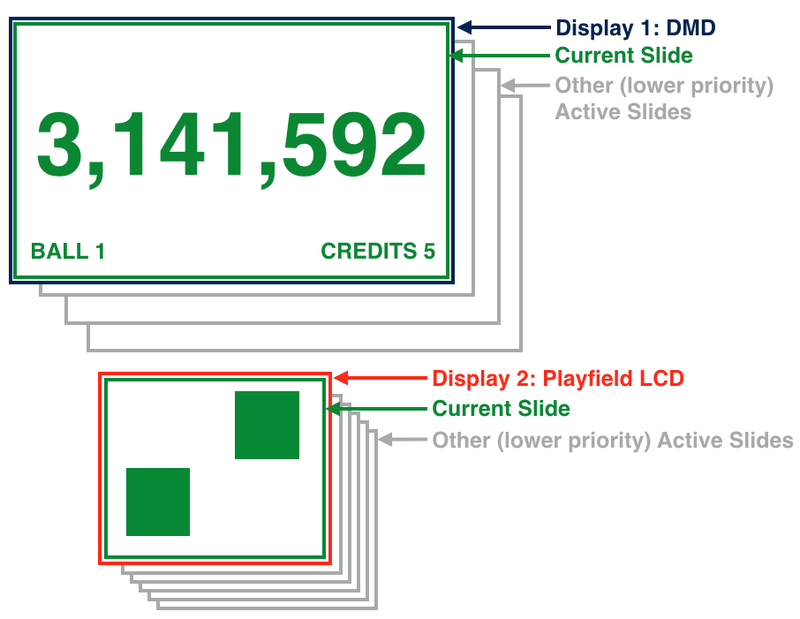 The priorities of the slides in the stack and the priority of the current slide on one display has nothing to do with the active and current slides of another display. These events can be useful within players. For example, if you want to play 3 slides as a mode begins then the mode_(name)_started event can trigger the slide_1 - but what triggers slide_2 and slide_3? The slide_player: can be used to sequence the playing of additional slides using the slide_slide_1_removed event to trigger the next slide to be played.